Out of over 1000 entries, Susan has been selected to appear in the bool series, Studio Visit. Scheduled to be released this summer, StudioVisit is distributed to over 2000 galleries, museum curators, and art aficionados throughout the country. It is an annual publication by Open Studios Press, Boston, MA. One of the paintings selected is It’s a Journey 2, 30×30”. 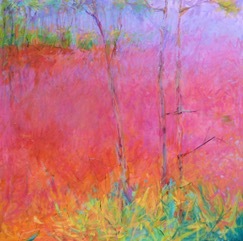 Susan’s painting, Sunset Glow has been selected for Art Matters, to provide art in public places. Large reproductions of the work are hanging in front of the new Hyatt Hotel in Grand Boulevard.Thanks to the CAA, Grand Boulevard, and the Hyatt for this opportunity. The original is available at the Foster Gallery, also in Grand Boulevard. 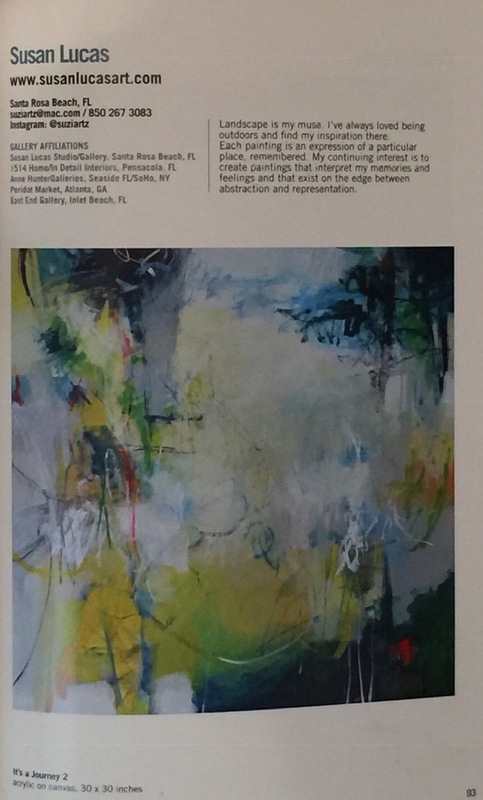 Artist of 30A Susan Lucas has been invited to exhibit during the month of September at the Anne Hunter Gallery at 25 Central Square in Seaside. 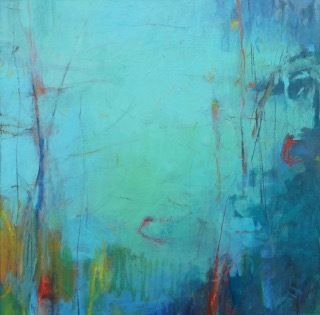 She will be showing new landscape work about mood, memory, and mystery as well as art from her “Coastal Waters” series. Come by for the First Friday ArtWalk and meet the artist! Susan’s recent painting, “Looking Across” has been selected out of over 5700 entries to be a finalist in the Artist’s Magazine Annual Art Competition. 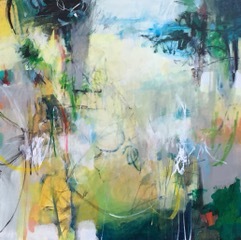 Artist Reception: Thursday June 6, from 5-7 p.m.
Artists of 30A invites you to join artist Susan Lucas as she unveils new work at the Hidden Lantern Gallery in Rosemary Beach. The Gallery is at 84 N. Barrett Square in Rosemary Beach, 850-231-0091. The work will be on display through September 29 if you are unable to attend the reception. Paint with Susan! To sign up for art classes this fall, email suziartz@mac.com or call 850-267-3083.